SoftPlanet makes it possible for everyone to get free WinSysClean download directly from our servers. There is no registration needed for downloading. Have you noticed lately that your computer runs slowly? Did you download a bunch of free programs and applications? If yes, then it's time for WinSysClean 16.02 to take care of you. This program cleans, fixes and optimizes your PC only with a few mouse clicks. Moreover, it performs complex analysis and detects the useful from the useless data. It is one of the best tools for computer novices who need a fast, effective and reliable application to fix most of the issues with their systems. 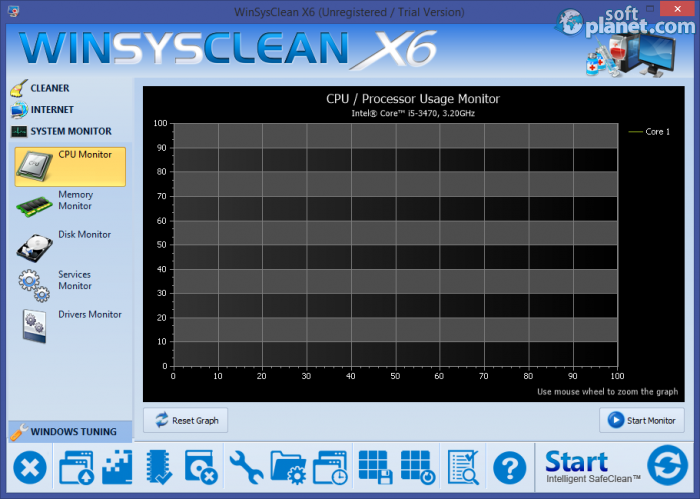 WinSysClean is probably overloaded with features, options and extra tools for good. Some of the most important ones are File & Disk Cleaner, Applications Cleaner, Registry Cleaner, System Monitor, Windows Tuning and more. Except English, German is the other available program interface language. A rich Help topic explains everything about all the items and tasks this program has. You need to know that all currently opened web browsers need to be closed before WinSysClean X4 can be run. From the user's point of view the program's interface is organized not badly at all. The left side is dedicated to the modules pane. All the tools and settings are grouped in four expandable tabs. The first icon from the first tab shows your general system status. You can see brief system info, temporary folder and recycle bin file sizes, RAM and disk usage and last, but not least the registry size. This program does not have any menus at all. Instead all the functions are gently organized in a toolbar at the bottom of the application's window. To learn how to use WinSysClean 16.02 you have to take your time. For sure you can press the big Start button in the lower right corner to engage the cleaning. It will perform its tasks with the default program configuration. Then the final result will be shown to you in a nicely organized cleaning report. From the icons at the bottom you can edit the Windows start-up, defragment the hard drive, uninstall a program, create or restore the registry etc. 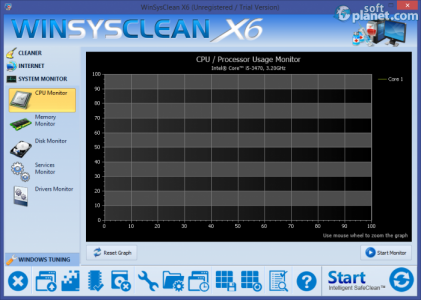 WinSysClean 16.02 takes one of the top places in its category. It is a many-time-award winner and attracts more and more users around the globe every day. Its cleaning and tune-up tools are capable of cleaning any computer at any time, no matter how bad it looks. We were very nicely surprised by its performance and warmly recommend that you try it and if you like it – buy a valid license for it. Our security scan shows that WinSysClean is clean from viruses. 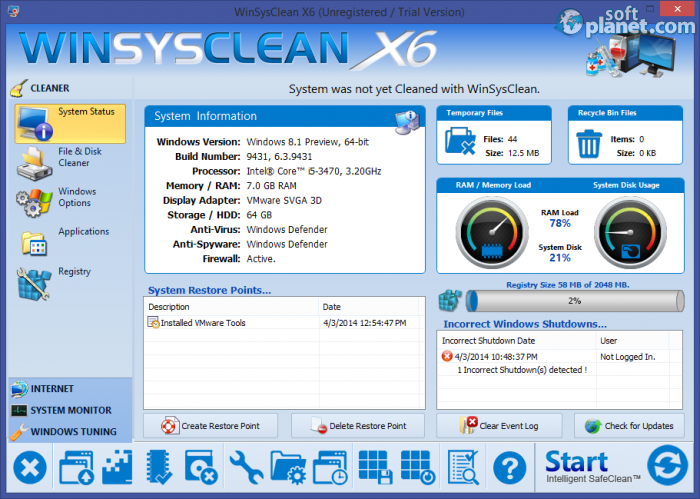 The current version of WinSysClean has been scanned by our system, which contains 46 different anti-virus algorithms. That ensures that WinSysClean 16.02 is 100% safe for your computer.